Trade Risk has won a Feefo Gold Service award, an independent seal of excellence that recognises businesses for delivering exceptional experiences, rated by real customers. 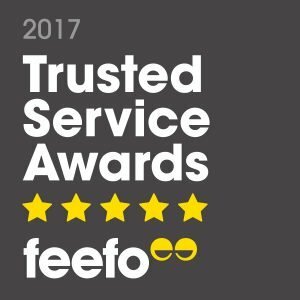 Created by Feefo, Trusted Service is awarded to businesses that use Feefo to collect genuine ratings and reviews. A badge of honour, this accreditation remains unique as all the awards are based purely on the interactions with verified customers. This feedback has been collated by the Feefo review platform, with the accolades being awarded based upon performance. Trade Risk met the criteria of collecting at least 50 reviews between January 1st 2016 and December 31st 2016, and achieved a Feefo service rating of between 4.5 and 5.0. Feefo is a ratings and reviews, and customer analytics platform. We collect genuine, purchase-verified reviews on behalf of over 3,000 businesses. Feefo ensures that all feedback is authentic, by matching it to a legitimate transaction; we believe this is the best way to combat the rising issue of fake reviews. Feefo is a global reviews and customer analytics solution to boost business & build trust. Feefo collects reliable customer feedback to deliver up to date insights so businesses and consumers can make better decisions. Feefo does this on behalf of 3,000 companies, providing reviews and customer analytics for more than 5,000 websites. Clients include Expedia, AXA, The White Company, Moss Bros, Notonthehighstreet.com & Tepilo. Trade Risk is one of Australia’s leading providers of insurance to tradespeople, with over 3,000 tradies from all over Australia trusting Trade Risk with their insurance needs. Trade Risk’s online platform makes it quicker, easier and cheaper for tradies to get the cover they need.